This entry was posted in celebration, empowerment, inner wisdom, inspiration, intentions, laughter, life, Lifestyle, personal growth, positive energy, positivity, self, self-acceptance, Spring, Strength and tagged attitude, enjoyment, family, food, friends, garden, gardening, goals, inspiration, intentions, laughter, lifestyle, lists, loving life, nature, organization, Plan of Attack, positive attitude, Positive thinking, priorities, sassy, self, wellness, whimsy, work. Bookmark the permalink. I wish I was a bit more spontaneous and whimsical, but I’m not. I definitely like my lists, although the form has changed over the years. I used to make lists so I could cross things off as I complete them…to-do type single items. Now my lists are more goal-oriented. If list/goal making works for you, go for it! We all need balance in our life though so I would encourage you to do something spontaneous once in a while! Whimsy makes life more colourful. I occasionally get all “listy” and organize myself. I am a list freak when hosting get-togethers and parties. That’s the only way to stay on track. Really love your list and your image and quotes! I’m a nonplanner, too. That;s how I ended up in CA within 36 hours of booking a flight…and I’m having so much fun here! Thanks! I love that you just “took off” on a whim, Cyndi! So fabulous. Glad that you are having a blast! California is so incredible. You certainly are a list maker…and a darn great one at that! Perhaps I should start carrying sticky notes in my lunch bag for us to use while in the work truck. You know how easy I (we) forget stuff after we get home! 😉 Thanks for commenting, Sheryl. Dancing is highly important as you know. See you soon! I must confess that the older I have got the less goal- oriented I’ve become. I mostly live in the moment and it’s what i do and how I use the material of the moment that ultimately determines the future. For me, in looking after and nurturing the moment, the future looks after itself and the past becomes a rich tapestry of memory. Thanks for the post, Melissa. Always so good. Thank you, Don. I love your word-weave “For me, in looking after and nurturing the moment, the future looks after itself and the past becomes a rich tapestry of memory.” Lovely. 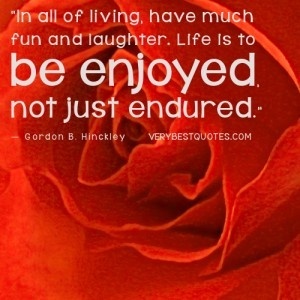 Living in the moment allows us to enjoy life so much more. When we rush to “get on with it”, a lot of the moments of pure substance are lost. It really is the little things that make the every day extraordinary! Your are a wonderful role model Mels. Why, thank you. You are a powerhouse of awesomeness in my eyes. On my list for today: find yesterday’s list, see if I need to appologize to anyone for not showing up, feeding them, or paying them, then, take an ice cream brake. Next, add “purchase ice cream” to tomorrows list. Love it! You sound about as organized as I am. Enjoy your ice cream.